liberated by the Luna Wolves to limit the Ork travels. Horus Lupercal sends the word of its liberation and it was decided that it should be populated. a swift and effectively executed attack, they allbecame slaughtered by the Luna Wolves. In the rest of the sector the Luna Wolves only meet sporadic resistance and it didn't take long before the sector was liberated. his skull. The few Orks that remained started to flee only to die by bolter fire. trying to erase that could be considered heresy. Olof the Grim has made a huge impact on the Sviar Worlds. Even today almost every Sviar carry a Fenris name, and so do places. armour as a sign of respect and as a honor of Olaf the grim. the few workers took this secret with them to their graves. depicting Olof the Grim. The legend does not say whether the tomb is empty or not. Only the secret priesthood knows the truth about the legend. "The day of the Wolf" and "the Olofs day" are holidays on all of the Sviars planets. They are celebrated with a big feast to honor their heros. areas of expertise. This is followed by an intense and long regular training. and to inspire the PDF soldiers to great deeds. The high ranking PDF officers can promote a experienced Sargeant. When deemed ready you can choose to join the Imperial Guard. Capital. They serve as a elite unit, and train intensively six days a week. temple. The temple has a secretive priesthood, the Inquisition has no more data on them. many duties, is to translate a very distorted form of High Gothic to High Gothic. procedures. On top of the roof you'll find a large aircraft pad. The V-shaped building in the southern part of the district is a research facility. Upasla has a Forge World. It produces all the equipment for the Sviars Imperial Guard and for the PDF. Half of the World is covered with forests to provide air for the population. If a new city is to be built the engineers must calculate how many if any trees should be cut down to make room for a new city. Right now there is room for at least ten more cities without having a shortness of air. of the surface is covered in cereal fields. Some farmers are stationed here permanently, while some work for a month and after that take the shuttle to Sviar 1 for a month leave and return to work the following month. manned by 200 PDF guards,they do all the chores. They too, like some farmers work in a monthly shift. The farmers use huge harvesting vessels. can intervein if things get out of control. been wiped out to make room for the cereal fields. Sviar 3 is a moon that orbits around the Sviar 1. Sviar 3 is covered with a dense jungle, swamps and variety of plants, some of them is very toxic. trees that has grown together in a way that itresembles the two headed eagle. The tribesmen and tribeswomen belive that this is a sign from the Holy God- Emperor. Beneath that tree they fight to win a place in the PDF. As service for the Holy God-Emperor is the highest honor they can receive. Most of them is skilled survivalists and often qualify for Imperial Guard duty, so they are the only force that will be sent to death world assignment. oncoming threat. Scattered along Sviar3 is hidden long range defense missiles. this planets golden age he thought. Now it served as a temporary regimental HQ for the Sviars 177:th infantry. at least I'm awake now he thought and got to his feet. He went to the mess hall and picked up some soup and bread on his way to his bed. arrived the following day. Gustav said goodbye to his crying mother, his father said very little but he could see the pride in his eyes. apart and reassemble their Lasguns the fastest. After seven years of fighting the lore of the Guard had been replaced with the grim reality. This world has claimed some brave and fine soldiers life. This was supposed to be a rutin mission. supply crates in the cargo bay. and went out. Gustav put down the guitar and closed his and shortly after fell asleep. 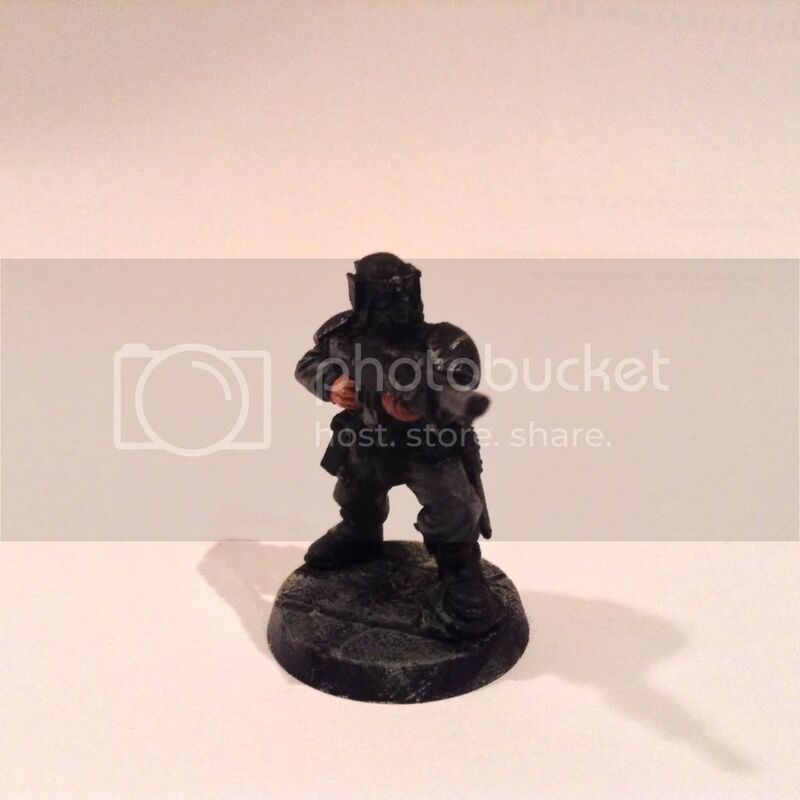 Edited by WarriorFish, 27 April 2014 - 01:26 PM. Here's my entry, will post the history in a bit. Repent! For tomorrow you die! For the Khan and the Emperor For Russ! For the Wolftime! I have a lot of sympathy for the Mantis Warriors. They've had to endure some of the worst events in WH40k. The Badab War, the Tyranid incursions, C.S. Goto. The worst. As requested here is the write up for the Guardsmen Einzig. As I am sure you will see I humbly recommend this Guardsmen for your personal retinue. I am sure he will be a valuable addition. Apologies, My Lord. This is as you are aware standard procedure and it's thorough and irrevocable and alas it cannot be recovered. Took part in the week long conflict for the bitterly contested outlying Hive town of Towk and after being the first squad into its perimeter recovering a plasma rifle from a deceased squad member after the ambush which killed or wounded the present Sergeants, preventing it from falling into heretic hands and then using it effectively to repulse the enemy allowing time for an organised retreat. With the addition of several squads of Shock Troopers and Chimera support he lead the remains of his squad back into the town and is confirmed as first through the breach and accountable for at least 34 heretic deaths. As one of the squads in the battalion that commenced the siege, Einzig and his unit were instrumental in securing the encirclement against several night break out attempts (or raids, no heretics survived to be interrogated as to their aim) and was praised by the new Sergeant for his prowess in close combat. 3 weeks later when the Hive was surrounded and the order given for no prisoners Guardsmen Einzig was part of the front line and was tireless and unwavering in his accuracy. All heretics attempting to flee the mass poison gas attack on the hive were killed. Due to the sheer numbers of heretics it cannot be estimated at his individual kills. Guardsmen Einzig once again found himself at the front line at the recovery post in Kaul Pass where the last remnants of the heretic forces made a last ditch attempt to break through 501st lines. Coming from an unexpected angle the heretic forces bore down on Kaul Pass where several regiments of Shock Troopers were resting after the successful capture of Hive Cardholt. Guardsmen Einzig is credited with spotting the heretics and making it to the recovery post in time to raise the alarm. Captain Booth was in attendance to rally the forces at his disposal and repel the attack. Valkyrie squadrons in the area were re-directed and provided support to the counter-attack which destroyed the heretic force. Guardsmen Einzig was once again at the forefront of the attack. 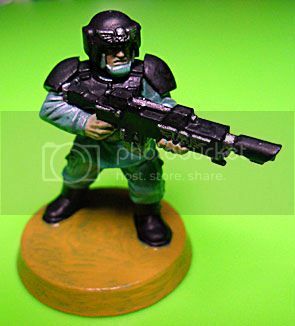 Guardsmen Einzig is a typical Swaibian Shock Trooper. Courageous, skilful and intelligent he has more than once proved his ability and proved his merit in the 501st. Regrettably he also shares the trait of some 7th Kindgom Guardsmen of thinking not all the rules need apply to them. As such he remains uncredited with many brave actions as he seems unable to somehow tarnish his achievement. Something which in the strict regimes of the 7th Kingdom is an issue but in your line of work my Lord I think he is ideally suited. In conclusion, he is the ideal soldier and I would happily have more like him and I am confident he will excel in the less regimented profession of your noble self. Like many other systems Swaibia was plunged into darkness during the Age of Strife and while all knowledge of what happened was lost, Imperial records note that upon reintroduction to the rest of mankind after the warp storms ended the planet of Swaibia III was the only planet with any life left, the other 2 habited planets being nothing more than barren husks. Whatever internal strife that reduced them to ruin was unable to be discovered. The inhabitants of Swaibia III, if indeed they knew anything, refused to give anything away to the inquiries of the Imperials. What they did find was a series of independent kingdoms - 6 in total, each of which only too happy to tell all about why the other kingdoms were not to be trusted, cowardly, traitorous and deserving nothing but death and destruction. The various kingdoms were constantly at a state of war with at least one other faction, however they came about being lost to the voids of time and presumably the reasons for them all being at each other throats constantly with it. Cut off from any forge World and at a constant state of conflict their equipment was old technology, several editions behind the Imperial forces who came to the planet. Soldiers re-used guns, armour, helmets, tanks, aircraft - everything was recycled and nothing could be wasted. Despite this technological deficit the forces of the planet were battle hardened and disciplined. A fact that Imperial observers did not miss. The Imperium wasted no time in threatening, coercing and persuading all the kingdoms to come together and accept Imperial rule. Being backed up by a vast and powerful fleet and army most likely helped the Swaibians see the error of their ways. Though the first few decades were a trial with no end of disagreements and misunderstandings (deliberate or otherwise), almost coming to blows more times than anyone cares to remember. However the all encompassing comfort of being reunited with mankind under the leadership of this new Emperor helped put things into perspective... not to mention first contact with Xenos. A central location was selected to avoid insult to any of the Kingdoms and a manufactorum was set up to ensure the Swaibians would be kept supplied. Over time military installations and training grounds sprung up around it as the font of all weapons and armour, creating a miniature realm unto itself. Under the watchful eye of Imperial observers the Swaibians were brought into line and prepared for joining the countless billions of humans under arms in the Emperor's name. During this acclimatisation period old feuds still reared their ugly heads and despite outward appearances of unity there were still simmering tensions between the forces of the 6 Kingdoms. This was to be expected and the Imperial liaisons were mostly prepared for any incident, after all Swaibia was lucky to be far from any Xenos threat and it was all to easy for them to forget about the perils of the universe and concentrate on their own petty rivals and conflicts. However, as the saying goes foreign travel narrows the mind wonderfully. After the first battle against the Orks the Swaibians found it a lot easier to come together and unite against the common foe. Which is not to say they had it easy. Their first battle was a pyrrhic victory at best, their armies only just holding back the Ork onslaught with terrible casualties. The Swabians were shocked and appalled at the ferocity of the greenskin and baffled by their unconventional warfare. The Swaibians would have to learn quickly the new rules of war if they were to survive. So the Swaibian armies moulded together in the crucible of war, their force shrinking after every campaign but becoming well versed in the modern art of war against all the foes imaginable. Blood feuds hundreds of years old were forgotten, bonds were forged anew in the light of the Emperor - kingdoms which spared no quarter to each other previously now competed for accolades and glory in the Great Crusade... but it was not to last. The Horus Heresy was in motion and the terrible events of those years were to change everything. As with many chronicles of the Heresy, as indeed the Age of Strife before it, today no clear picture can be conjured of what happened. It is certain that the Swabians sided with the loyalist forces but what they did, where they were and what happened to most of them none can say. Many years after events had settled and the Imperial forces began to pick up the pieces one fragment of the Swaibian army returned to their home world. The 501st numbered only just over half a million soldiers and they were exhausted and broken. The survivors retreated to their barracks to lick their wounds, none of them returning to their original homes. These were dark times for the whole Imperium, but the spirit of mankind cannot be broken. The 501st would rebuild the Swaibian war machine and rejoin the fight for mankind's survival. The Imperium would climb back up the cliff it had fallen down and the Swabiians vowed to do their part once more. After the loss of so many men and women in the Great Crusade the Swabians declared that from henceforth there would always be a 501st Regiment under arms in honour of the few who made it home. The barracks and infrastructure around the Manufactorum were given over to the 501st (a formality as any attempts to entice them out met with failure) and was enshrined in law for eternity as a separate realm, independent of any of the other 6 Kingdoms. The 501st would be kept in existence by filling it with the best soldiers from all the kingdoms, outfitted with the very weapons that the original members carried into the Great Crusade. This body of men and women would carry with them the scarred lasguns, battle tanks and flags of their ancestors - with them they would smite the foes of the Emperor like they did before at the pinnacle of human endeavour. Thus would those days never die and they would stand eternal alongside the Emperor himself. So it has always been - the 501st is always kept at full strength, skimming the very best from other regiments to keep it at fighting strength and leading from the front. The 501st are put in the most critical positions, the most forlorn attacks and the most desperate defences. Each time they have not been found wanting. Some say the light of the Emperor from the times of the Great Crusade still resides in the ancient wargear they use, spurring them onto great acts of valour, always snatching victory from the jaws of defeat. Whatever it is the men and women of the 501st rightly believe they are the best that Swaibia has to offer. There is a unique esprit de corps in the regiment, surpassing all previous fealty to Kingdom or ruler. They were nicknamed the 7th Kingdom - as a separate kingdom with no land, no history and no old rivalries - and some say even then that the 7th Kingdom resides back in the legendary days of the Great Crusade when the Emperor himself still strode among mortals. So it is that to be in the 501st is to be closer to the glorious days of the Great Crusade, their brave ancestors and to the Emperor himself. Who could not feel a part of something special, a part of a greater cause and belief when the humble lasgun in your grip once crossed the stars in the name of the Emperor to unite the fragmented children of Mankind? I think there's been some good blurb put up in this topic, I've enjoyed reading them as part of my duty I particularly like the sound of Sviar's world, all that feasting and mead! Well done to those completing, for the rest of you there are still a few hours left! Get your picture in to successfully complete your vow, the background pieces are not required as part of the minimum so don't worry about them if you're pressed for time! Annoyingly, I'm going to miss the deadline for completing my model. Remodelling our kitchen is taking longer than I thought and my paints are packed away while the work goes on. Can I still add my pictures and stories to the thread after the completion deadline? That's unfortunate to hear, you are of course more than welcome to post up your stuff after the deadline. That's the sort of resolve we expect in the Guard - dogged determination to complete your duties even when it all is lost! Thanks Dan. He's based off an NPC in an Only War campaign I'm running. I made some models as place holders until the player made their own. The player in question names his companions after Batman characters & Bane was his first. He's gone through Talia as well & is currently assisted by Oracle. Trooper history for now with the regiment's recent history to follow. Hopefully can get that done before the deadline. Bane Cobb is currently the CO of Fifth Platoon, Third Company in the Elysian Drop Troop 15th Regiment and is under evaluation for field promotion to company level command. 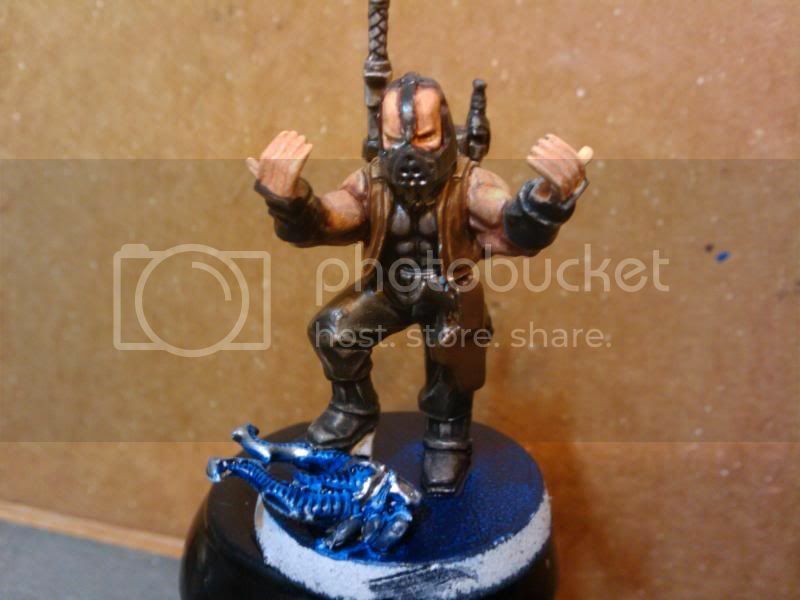 Bane first entered Imperial service when he joined the Elysian SDF in his youth. He distinguished himself during a pirate interdiction campaign where he was wounded clearing out a major pirate stronghold. Ambushed when an op went wrong, Bane took charge after the squad leaders of the assault teams were killed. Grabbing a fallen plasma pistol, Bane blew a hole in a wall for the squads to exit through, then proceeded to flank the pirates. After recovering from his wounds he was sent to the next Elysian founding and began his career in the Imperial Guard. Bane soon found himself singled out by the one Lieutenant Abrey Cornielus, assisting the officer in his duties as platoon CO. During the Heimdall pacification Bane was given a field promotion after Lt. Cornielus was inducted by the *Redacted by order of the * =][= WARNING: Clearance level insufficient. Restricted access logged and transmitted =][=. Under his command, Fifth Platoon was instrumental in defending the Imperial Cathedral Lux Aeterna earning the favor of the Ecclessiarcy and the Order of the Valorous Heart. Currently Bane is deployed on the Hades Liberation. A mining world currently under heavy siege by forces of the Arch-Enemy, regimental losses suffered in the early stages of the conflict have resulted in Bane receiving a field promotion to the rank of Acting Captain. His performance on the campaign will see whether Bane will officially be made Captain of the 15th Regiment of the Elysian Drop Troops or another of the talented officers will be chosen instead. Just an hour until the deadline! Ok, He aint pretty, base paint is still wet had troubles with colours but here he is lol. To the North West of Imperial Space, Segmentum Obscuris, past the Cygnus Arm lies a relatively unknown Knight World called Verdant Secundus. It is the second largest planet after Verdant Prime in the Verdant Prime system of 3 planets. Verdant Prime was once a lush and green world but suffered terribly after a dreaded Chaos attack. What members of the Knight families ruling class were forced to flee for their lives and make a concerted effort to repel the invaders on Verdant Secundus. Here they stood united with their brothers and did indeed save themselves and their planet. Due to the decimation of the natural habitat on Prime, Secundus became the home for many knight families and the 3 moons circling it became outposts so that any future invasions could be detected earlier. Each Moon of Secundus has 1 large Garrison, and the 3rd moon is the furthest away, so is the 1st to realise any imminent attack. The Planetary Defence force of the system is fairly similar to that of the Astra Militarum, in that the troopers are the backbone of the force and are issued with standard Imperium equipment. The terrain is a mix of desert and green woody areas, pre-dominantly around built up areas. This means that vehicles are not in use so much as mostly the defence systems in place are 'defensive' based. For example the use of Fortresses, Defensive walls, Firestorm redoubts for anti-air mean more standard Imperial transports for troop usage are not used extensively. What the trooper aspect does include is lots of heavy weapons platoons and the occasional use of veterans who use carapace armour. Squads each number 10 troopers with a Sergeant in charge. The veterans use some aircraft for quick insertions. Imperial Knights are much more common on Verdant Secundus itself. However each moon also has a trio of Knights at each Garrison. They can be rotated with other Knights back on Secundus at the whims of the ruling class. Whatever their reasoning for being there it is a splendid sight to behold a gigantic Knight or 2 backed up by scores of infantry armed with heavy weapons, rallied behind defensive walls and towers. Currently there is an Imperial fleet passing on its way to the meet a xenos incursion, which is a real rarity. No doubt many Knights are being prepped and Households will be wanting in on the action. Really enjoyed having a quick look through here at all the entries! Great Stuff! Edited by WarriorFish, 27 April 2014 - 01:27 PM. In with some time to spare, well done cod! The deadline hits in half an hour, will any more of our wayward comrades make it in time? Well done to all those that successfully completed! We mourn our lost comrades who didn't make it, let their failure be a lesson to us all. Promotions and badges will be presented tomorrow, wear your badges with pride and let all who see them know that your faith, resolve and valour are second to none! Congratulations to those who earned their stripes, commiserations to those who failed in their service to their regiment and the Golden Throne (your chance for redemption approaches...). And most importantly a huge thank you to all those who took part, to The Shadow Guard for the `One for All, All for One` banners many of you display in your signatures and last but not least to my fellow IG mods (particularly WarriorFish for constantly being on the ball with updates and threats encouragement...and for the forthcoming medals!). Huzzah! Glory to the Emperor! Well done to all who finished, and thank you to both mods, who kept us on our toes, and entertained us with witty comments. Thanks guys! Great little event.I really enjoyed it. For someone who loves the creative side of the hobby it has been a real pleasure seeing what everyone here has come up with. Also I have now got myself a nice little armoured company allied detachment planned, so cheers. I'll chime in with my thanks to the organisers and fellow participents too - I enjoyed being part of this I've never participated in such an event before. Being part of a collective effort and seeing everyone else posting up their work was inspiring. That said I realise my time limitations as I was cutting it fine with just one model... so perhaps I'm not quite ready for any other painting events. Anyway, I look forward to seeing the badges we can proudly display in our signitures! I hope I got it in time. Havener,P.D.F.I'm in . My guard are from Haven, a small world orbitting a gas giant called, Cats Eye. Trooper, Talens Mydol. 109th Lad Gaters,of Haven. Talens, joined the 109th,when the Commisar,made his recruitment trip through the highlands. His parents had moved from the steppes,down the highlands. The high steppes, didn't offer the family the best opportunity. His father taught him,how to ride a muskylope,a native creature of ,Haven. He tried to enlist in the, Rider Regiment,but he wasn't considered. The Gaters,function as, Planetary Defense Force,and occasionally find themselves far away from home. Haven, itself falls under the hegemony of the, Imperial Navy. Cat's Eye, provides fuel resources,as , Haven has only three major industries. First,mining from both, Cat's Eye,and from shock stone a natural quartz-like crystal that holds energy ,when charged. Second forestry, ironwood native to ,Haven. Third agriculture,in the lowlands great fields of wheat,and rye,as well as barley,and oats. The 109th Land Gaters,are a planetary defense force,that occassionally ship out for the occassional crusade. Haveners make good tankers, the large farms mean farm boys with experience with equipment. A Leman Russ, is just a tractor with a gun. Mydol,has just begun his tour of duty,as a city dweller, he has been placed within the mechanized infantry. Edited by walter h, 27 April 2014 - 05:02 PM. Thank you to the Mods for running this challenge, and congratulations to all who participated! Now that we've done one trooper, we need to do about a hundred more minimum to stand shoulder to shoulder, right? Well there is alway's the ETL. and now I have more of my paints ready ,and my files. Found my bits ,and the old clamp as well as my magnifier. It was fun. Added painted picture . Modified my original post too. Had to rush it though, did this in 20 mins or so. Planned to finish my entry this evening, but been taking care of sick gf. Regiment bio is going to be late . Edited by Maelarion, 28 April 2014 - 06:20 AM. For the rest of you, here are your badges and/or medals for you to pin on your signatures! Step forward Malus Trux, you have fought with valour and are an example to your comrades in arms. Wear your corporal rank in full knowledge of your great resolve. Thanks mods for running this awesome event. Its really got me in the spirit for the ETL. I hope that in the future that there will be more events like this in the I.G section of the b&c. Hey look at me! I'm a lance corporal and with a badge to prove it! That was fantastic guys - congratulation for running such an involving and fun event! Also congratulations to all who took part - the IG forum is set for new height of glory with such audience!